The headline inflation rate soared to 6.4 percent in August this year, the highest in more than nine years, prompting many Filipinos to start worrying if rising consumer prices will continue for long. Former President and now House Speaker Gloria Macapagal Arroyo, however, played down the issue and assured that the Duterte administration is doing the best it can to address the problem. “I have had a more alarming situation,” she even told reporters in early September, as reported by the Philippine Daily Inquirer. Arroyo said that the high inflation could be tamed in a matter of three months, as long as the government imposes proper counter-inflation measures like she did when she was president. She recounted the massive importation of rice as well as buying rice from local farmers as the main measures to slow down inflation. Consumer prices peaked at 10.5 percent during Arroyo’s administration, which was recorded on August 2008. It took 12 months before it slowed down to a low of 1.7 percent, based on data from the Bangko Sentral ng Pilipinas (BSP). While it’s true that surging inflation eventually tapers off, it still creates a heavy toll on low-income earners who have had a hard time meeting their daily needs because of higher consumer prices. In fact, the Social Weather Stations (SWS), the polling group that conducts a quarterly survey on how many Filipino households consider themselves poor, says that inflation is a major factor in explaining movements in self-rated poverty (SRP) levels. 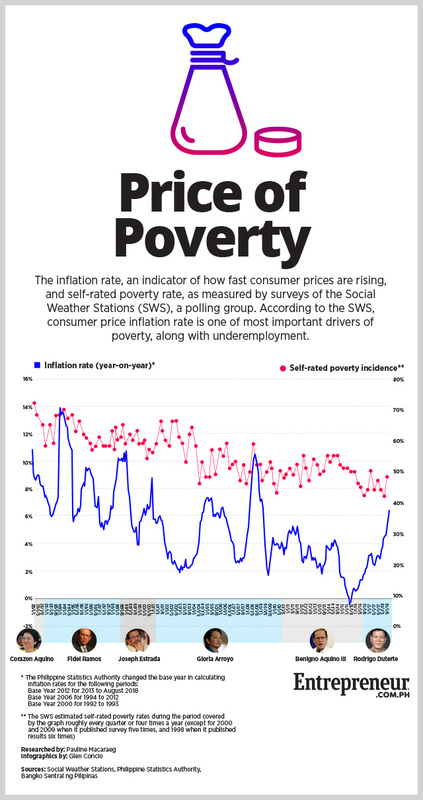 The self-rated poverty rate generally rises and falls along with the movement of inflation. This suggests that rising prices of consumer goods has a direct effect on the people’s standard of living. As inflation rises, more people tend to classify themselves as poor—and vice versa. Perhaps this explains why people are unduly worried by rising inflation despite assurances from their political leaders that rising consumer prices are only temporary. Rises and drops in consumer prices are not just statistical trends but are real and tangible events with often adverse impacts on the lives of poor households.